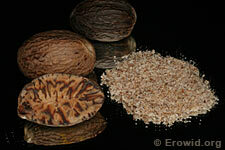 Myristica fragrans is a large evergreen tree that's fruit contains a large central seed (the nutmeg). It is used as a spice as well as acting as a deliriant if consumed in large quantities. Its effects are long-lasting and are considered unpleasant by most who experience them.